EmArcy label started in October 1954. Most famous EmArcy titles are 10-inch / 12-inch 33rpm LPs, but as we can see below, there are at least as much as 17 titles of 78rpm/45rpm EmArcy single releases, although 16004 (Red Prysock) was likely to be unreleased under EmArcy label (but released as Mercury 70367). 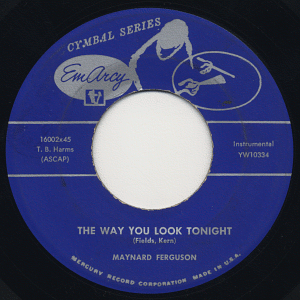 Early EmArcy 78rpm singles has “Cymbal Series” prints on the label (as seen on the label transition page). And some 45rpm singles also has the prints on the label (look at the image on the right). visitors to this page since January 04, 2004.